As a pro synthesist, Encanti has worked on projects with noteable companies Ableton, Cakewalk, Izotope, Source Audio, and Keith McMillen Instruments. Encanti has also worked on visual shows for EOTO and Shpongle, as well as having performed as a member of Shpongle Live‘s USA Ensemble. In the A/V duo Zebbler Encanti Experience, Encanti takes a novel approach to producing and performing electronic dance music, trademaked by combining heavy experimental dubstep with mind-bending synchronized visual accompaniment by VJ Zebbler. 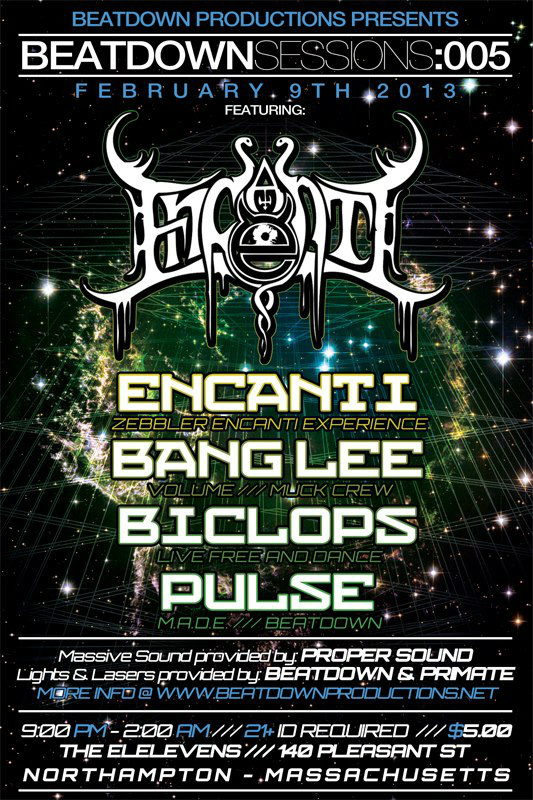 The drive behind Encanti tracks are influenced by hard dubstep producers, while the sound design draws influence from the legendary work of Richard Devine and Aphex Twin. Encanti performs his music live on laptop like an instrument, with breakdowns and mutations orchestrated on the fly.